The Daily GRRR! HEADLINES for Dec. 15, 2014. 1. 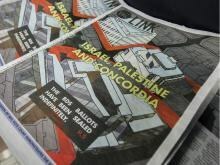 Concordia University undergrads vote yes for BDS on campus. 2. Only US and Israel oppose UN ban on weapons in outer space. 3. Direct action glues the locks on McGill’s drone research lab. 4. NEB email gloats about public’s limitations in challenging pipelines. 5. Enbridge fails to reassure communities at risk along Line 9. 6. Energy East pipeline info session met with protest in Winnipeg. 7. California train derails, leading to call for ban on crude-by-rail. Welcome back to SoundFM! You are now listening to The Daily GRRR! heard on the airwaves at 100.3fm, CKMS in Waterloo, Ontario, and SoundFM.ca on the web. This is Kathryn and I’ll be your host on this Monday morning show for December 15, 2014.
accredited student unions now officially support the BDS campaign; the Concordia Student Union (CSU) now joins the university’s Graduate Students’ Association (GSA), which endorsed the BDS in January 2013. “By joining this grassroots global movement for Palestinian human rights, students are highlighting the commitment of our campus to social justice and collective moral responsibility,” said Javier Hoyos, Chairperson of the Yes to BDS Committee. That’s right, earlier this month in a meeting of the United Nations, Israel and the United States were the only two countries to vote against a UN resolution calling for the prevention of an arms race in outer space. The resolution was among several dealing with international disarmament passed by the General Assembly on 2 December, including one calling on Israel to join the Nuclear Non-Proliferation Treaty and bring its rogue nuclear program under international supervision. Among the “yes” votes that voted for the initiative aimed at keeping space free of weapons were China and India, which both have space programs, along with the member states of the European Space Agency. That resolution passed with 174 countries voting in favor and a single abstention from the Ukraine. There was also a separate UN resolution put forward, calling for a prohibition on the development and manufacture of new types of weapons of mass destruction, and once again, the US and Israel were also the only two countries to vote against it. Among those voting for the ban on new weapons of mass destruction were Iran and Iraq, two states that have been subjected to devastating war or sanctions on the basis of dubious or fabricated Israeli and American claims that they intended to produce such weapons. “On the night of November 29, we snuck into the engineering department of McGill University and jammed the locks of the Aerospace Mechatronics Lab using superglue as a minimum gesture of solidarity with the survivors of the Israeli state's summer attack on Gaza, in which 800 drone strikes took place over the course of a 50 day period. Official documents obtained by campus group Demilitarize McGill through an access-to-information request reveal that the Aerospace Mechatronics Lab has received upwards of 262,000$ from the Canadian military to develop software for miniature drones or "strikebots" designed for surveillance and urban warfare. The advent of drone technology originally offered an oblivious public the "feel-good" fantasy of surgical-precision in the exercise of deadly force, whereas today we now know very well that there exists a significant body of data documenting the fact that US & Israeli drone campaigns have killed, injured, and displaced thousands of non-combatants in Afghanistan, Pakistan, Yemen, Somalia and the occupied territories. Drone strikes are also known to cause considerable and under-accounted-for suffering in the daily lives of ordinary people, beyond death and physical injury. For instance, drones hover 24 hours a day, 7 days a week over communities in the federally administered tribal areas (FATA) of North Western Pakistan, striking homes, vehicles and public spaces without warning. Their ubiquitous presence terrorizes entire populations, producing a social climate of unremitting psychological pain and horror. Womyn, men and little children whose only "terrorist activity" is to have been born on the wrong side of white supremacy and capitalist imperialism, are forced to live under the shadow of flying killer robots, attempting to live normal lives amid the permanent buzz of a distant propeller: a constant reminder of round-the-clock surveillance and imminent, violent death. As reported by The Vancouver Observer, Waterloo resident – now credited with finding crucial flaws in Enbridge’s Line 9 reversal pipeline in Southwest Ontario -- is sounding the alarm over an internal e-mail from the National Energy Board that appears to boast about new Harper government rules that reduce the public’s ability to ask questions at pipeline hearings. Louisette Lanteigne uncovered the e-mail via an Access to Information request. In the report attached to the memo, the NEB’s Hearing Manager for Oil Pipeline Applications told colleagues about the “successes” of a recently concluded Line 9A pipeline hearing in the summer of 2012. The manager states that the public’s inability to cross-examine witnesses at the hearing was one of several achievements: “Having only final oral argument and no cross examination worked well in this case,” wrote the NEB manager, “due to the highly technical issues regarding engineering and integrity." As reported by Hamilton CATCH, which stands for Citizens AT City Hall, Enbridge’s attempts to assuage concerns over the pipeline reversal aren’t convincing anyone. The company is assuring city staff that shutoff valves are not necessary to protect Hamilton’s largest stream, but has made no response to concerns about nationally significant wetlands crossed by the 40-year-old pipeline in which the company wants to expand capacity and transport diluted bitumen. The continuing conflict over more costly conditions being imposed on Line 9 by the National Energy Board is just one example of the push for greater municipal and provincial say about pipeline proposals including a massive cross-country project that would carry nearly four times more bitumen to export markets. TransCanada’s Energy East proposal would convert a natural gas pipeline and extend it to carry 1.1 million barrels a day from the Alberta tar sands across northern and eastern Ontario to new tanker ports on the St Lawrence River and in New Brunswick. Like the two stalled pipeline routes across British Columbia, Energy East is facing a wall of opposition that now includes conditions imposed by Canada’s two largest provinces, and an environmental report that has now forced at least the temporary abandonment of the St Lawrence tanker terminal. The threat imposed on endangered Beluga whales is the official reason why TransCanada Corp has stopped work on the St Lawrence port, but the company was also facing a unanimous Quebec legislature resolution demanding an environmental assessment “that includes in particular the overall contribution of the Energy East project to climate change and greenhouse gas emissions.” Unfortunately, as we reported in another recent episode of The Daily GRRR!, the premiers of Ontario and Quebec have since reneged on their joint decision to consider upstream emissions from the tar sands when determining whether or not to support the pipeline. This would remove a significant obstacle in getting the pipeline pushed through, which demonstrates yet again why we can’t put any trust in governments to protect our ecosystems from pipelines and other environmental dangers. As reported by West Coast Native News, several groups in Manitoba made their opposition to TransCanada’s proposed Energy East pipeline loud and clear last Friday, with demonstrators taking their message to the Delta hotel in downtown Winnipeg, where TransCanada was hosting an Energy East information session with aboriginal delegates. The protesters were angry that First Nations leaders are even talking to TransCanada about the proposed pipeline amid concerns about water quality and climate change. The proposed pipeline would transport crude oil through the province en route to eastern Canada, and citizens’ groups are calling on the National Energy Board to include a full audit of climate change impacts in its review of the proposed project. If approved, the $12-billion pipeline project would carry tar sands crude from Alberta through six provinces, including Manitoba, to refineries in Quebec and New Brunswick. TransCanada formally applied for federal government approval for Energy East with the National Energy Board earlier this fall, but there is growing environmental opposition in Ontario and Quebec to the plan. The Manitoba groups, which include the Manitoba Energy Justice Coalition, the Council of Canadians, Idle No More, Kairos, the University of Winnipeg Students Association and the Wilderness Committee, are urging the National Energy Board to consider the environmental and social effects of the proposed pipeline. As reported by the DeSmog Blog, a train derailment earlier this month in the golden state has prompted a California state legislator to call for a moratorium on crude-by-rail shipments through the state’s “most treacherous” passes. Twelve cars derailed on a Union Pacific rail line along the Feather River northeast of Oroville, CA in the early morning hours of November 5th. The state Office of Emergency Services responded by saying “we dodged a bullet” due to the fact that the train in this case was carrying not oil but corn, as some of its cargo spilled into the river. Democratic State Senator Jerry Hill, a vocal critic of the state’s emergency preparedness for responding to crude-by-rail accidents, does not think California should wait around for a bullet it can’t dodge before taking action. Hill sent a letter to Governor Jerry Brown calling for a moratorium on shipments of volatile crude oil from North Dakota’s Bakken Shale and other hazardous materials via the Feather River Canyon and several other high risk routes throughout California. “This incident serves as a warning alarm to the State of California,” Hill wrote in the letter. “Had Tuesday’s derailment resulted in a spill of oil, the spill could have caused serious contamination in the Feather River, flowing into Lake Oroville and contaminating California’s second largest reservoir that supplies water to the California Water Project and millions of people.” Hill’s letter goes on to mention the fact that increased use of crude transport by rail due to the fracking boom has also led to many more “fatal and devastating rail accidents involving large crude oil spills,” specifically raising the specter of the 2013 derailment and explosion of a train in Lac-Mégantic, Quebec, which killed 47 people and spilled 26,000 gallons of crude into the Chaudière River.